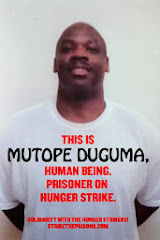 Mutope Duguma: There is Love in Peace! There is Love in Peace! We must take full responsibility for the current discipline that is being held inside these prisons since the recent release of the so-called ‘worst of the worst’ prisoners out of solitary confinement. It’s been an uphill battle, as many of us know, to uphold the discipline of the Agreement to End Hostilities, and there have been countless efforts made to maintain ‘peace’ on these prison yards amongst the races. We cannot allow no one, other than prisoners, to stake a claim in such discipline that is so prevalent throughout the CDCr, that we are now seeing materialize amongst the races. It’s been a beautiful ride thus far to see the social development occurring amongst races around the Agreement to End Hostilities. We, here at Calipatria state prison, have come to see the value in the Agreement of End Hostilities, where our Families, friends and associates are enjoying their incarcerated love ones!!! Proving there is Love in Peace!!! We are seeing prisoners under new laws and policies that many prison activist organizations have vigorously campaigned to put on the books, by way of legislation to our so-called ‘policy makers’ that are literally giving prisoners the opportunity to go home. We can only hope that our efforts will take on an effect that would lead to our communities, embracing this new found Peace. Whereas, each and every one of us who have been working very hard to establish prisoners under a new discipline should be proud of the fact that a lot of these young people will not ‘suffer’ the fate that many of us have suffered, due to the senseless racial violence that I/we believe was manipulated by our keepers, that led to many of us being murdered, maimed, and placed in solitary confinement units indefinitely. We all should admire and respect the strength that’s being demonstrated throughout CDCr by human beings who are considered the so-called worst of the worst.